The most neglected story of the city’s current 2018 Tricentennial celebrations is the immense contribution Latin American immigrants have made to the epic reconstruction in the thirteen years since Hurricane Katrina. City organizers have disappeared an immigrant community that has contributed their sweat, labor, and love to our rebirth and resurrection. This series of photos and photographic assemblages are Jose Torres-Tama’s creative responses to honor a heroic people in a city with a long Latin legacy, and challenge the brutal cultural deportation exacted in books such as New Orleans & the World published by the Louisiana Endowment for the Humanities. Immigrants have been rendered invisible in the LEH’s version of this city’s 300 Eurocentric years, and their anthology is being sold as the official chronicle of New Orleans history. 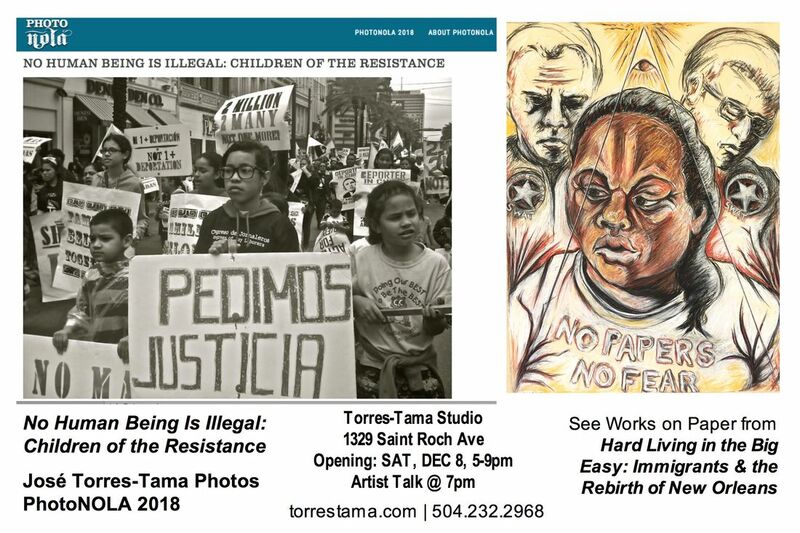 Since 2010, Torres-Tama has been documenting the “live art” public protests of the ﻿Congress of Day Laborers / El Congreso de Jornaleros,﻿ the immigrant activists group, and these new images focus on the Children of the Resistance, who are fighting for their undocumented parents to remain in a city they have helped to rebuild. Some images are developed into mixed media assemblages or Photo Retablos created from re-purposed wooden drawers found on the streets after the storm. He has created mini altars with these photo assemblages to honor the valiant and heroic work of the Congress of Day Laborers and their children, who are bearing witness to the persecution of their parents. A moving second-hand clock is placed at various points of each photo image, representing the beating heart of immigrants working in the shadows. Latin American immigrants in New Orleans face a clear and present danger of brutal deportations with a hostile White House administration pimping fear and anti-immigrant hysteria. Jose Torres-Tama, photographer and performance artist, will offer an Artist Talk about the photo series at 7pm, and will include a mini-performance tribute to the Latin American immigrant community and Congress of Day Laborers that are the inspiration of his photo assemblages and new mixed media photo images.